The Arctic is the region situated north of the Arctic Circle. It encompasses North America’s far north, Greenland, northern Europe and Asia, and the Arctic Ocean. This ocean is covered with pack ice that never completely thaws. Short tundra vegetation grows on the land, where the temperature rarely rises above 10°C. Despite the extreme living conditions, some indigenous peoples such as the Inuit and the Lapps have made their home in the Arctic. Only the animals that have best adapted to the cold, like the polar bear, Arctic fox and ringed seal, live in these hostile regions year-round. The walrus, harp seal and numerous bird species migrate when the cold intensifies. The Arctic and its inhabitants are sensitive to global warming as well as marine and atmospheric pollution that accumulates in the region, carried there by the winds and currents. The Arctic willow (Salix arctica) is one of the smallest trees in the world and one of the very few that can withstand the frigid, dry climate of the North. This dwarf tree does not grow more than 20 cm high and its branches hug the ground. Its shallow roots have adapted to the thin and often frozen layer of soil on the tundra. The Arctic willow feeds a number of animals such as musk ox, Arctic hare and caribou. The Arctic tern (Sterna paradisaea) holds the world’s distance record for migration. Each year, this tireless bird travels a distance of about 35,000 km, which takes it from the Arctic to the Antarctic. 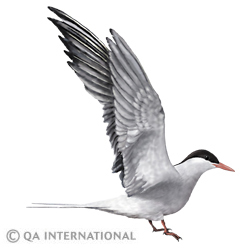 While flying from one polar region to the other, the tern takes advantage of the abundance of available food (fish, plankton, crustaceans, etc.) as well as the long hours of sunshine that benefit each pole in turn, depending on the time of year. 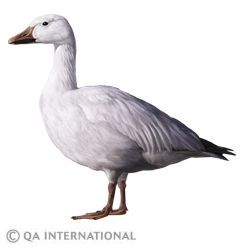 In summer, the snow goose (Chen caerulescens) nests in large colonies on the Arctic tundra, eating grass, berries and seeds. When fall comes, it migrates south in giant flocks to Mexico and the southern United States, where it spends winter living on the plains and in the fields. In the spring, the snow goose resumes its journey and heads back to the Canadian North. The bowhead whale (Balaena mysticetus), also known as the Greenland whale, measures almost 20 m long and can live more than 100 years! Like other baleen whales, its mouth is equipped with comblike structures that allow it to filter the water to capture plankton. Perfectly adapted to life in the polar environment, the bowhead whale has no dorsal fin and uses its enormous head to break through the thick ice in order to breathe. In 2007, the first protected area for bowhead whales was created in Canada. Belugas (Delphinapterus leucas) move in groups of hundreds of individuals, mainly in the cold and shallow waters of the Arctic Ocean and the North Atlantic. These small white whales, measuring 4 m long on average, communicate through an impressive range of sounds, earning them the nickname “sea canaries”. 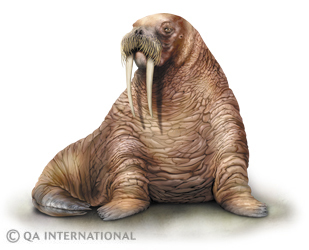 Walruses (Odobenus rosmarus) divide their time between the land and the sea. 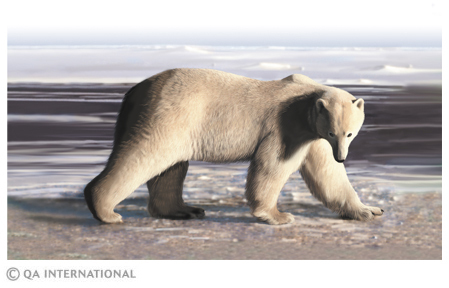 They feed on small invertebrates in the cold waters at the bottom of the Arctic Ocean, but also join by the thousands on beaches to rest and to cub. The males weigh more than 1 metric ton and measure 3 m long. Their tusks, which measure up to 1 m long, help the walruses hoist themselves onto the ice or break it, and are also used in battles. The Arctic fox (Vulpes lagopus), which measures 85 cm long, has dense fur that changes color with the seasons. In winter, its white fur makes it invisible in the snow. In summer, it blends into the tundra landscape with its brown back. Thanks to its thick fur, short muzzle and small ears that limit heat loss, the Arctic fox can withstand temperatures of –70°C. This carnivore eats small mammals, birds and carcasses. 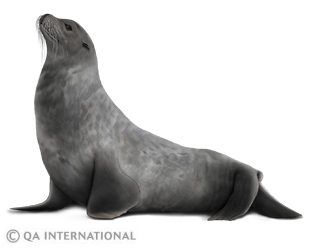 The most common of the Arctic seals, the ringed seal (Pusa hispida) gets its name from the ring-shaped spots on its fur. The adults build dens in the ice to protect their newborn from the cold, polar bears and Arctic foxes. These dens have direct access to the sea, where the seals feed on fish and crustaceans. The polar bear (Ursus maritimus), or white bear, is the largest and most powerful of the land predators. This solitary giant can measure up to 3 m long and weigh almost 700 kg! Like many animals of the Arctic, it has white fur that allows it to pass unnoticed on snowy landscapes. It hunts seals, which it can kill with a single blow of its paw. It is estimated that there remain 20,000 to 25,000 polar bears, with most of them living in the Canadian Arctic. 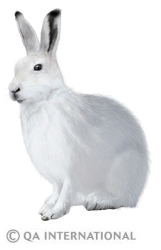 The Arctic hare (Lepus arcticus) lives in Greenland and North America’s far north. It digs its shelter in the snow to sleep and to protect itself from the wind and intense cold of winter. Its hind feet are covered in dense fur to help preserve body heat. When it senses a wolf or fox approaching, this small mammal rises up on its hind legs and bounds away at a speed of up to 50 km/h! 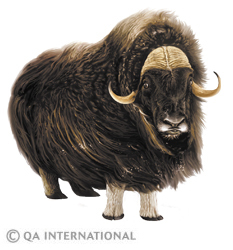 On the Arctic tundra, musk ox (Ovibos moschatus) huddle together to stay warm. These 1.3 m tall mammals are herbivores. They have a heavy coat of fur that allows them to brave temperatures of –70 °C. When they are attacked by bears or wolves, the adult male and female musk ox form a circle and place their young in the middle to protect them.